KENNEDY SPACE CENTER, FL--Enduring the heat of re-entry one last time, the shuttle Discovery dropped out of orbit and returned to Earth Wednesday to wrap up a near-flawless 39th and final mission, a milestone marking the beginning of the end for NASA's winged rocketships. After firing its twin braking rockets for a computer-controlled descent halfway around the planet, commander Steven Lindsey took over manual control and guided Discovery through a 250-degree left turn to line up on runway 15. 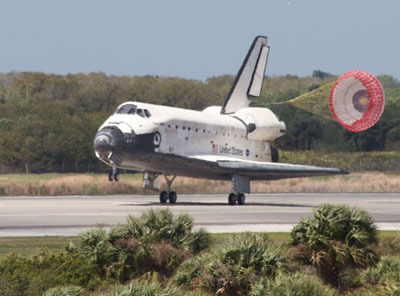 Pilot Eric Boe then deployed the ship's landing gear and the 204,000-pound shuttle swooped to a tire-smoking touchdown on runway 15 at 11:57:17 a.m. EST (GMT-5). Lindsey had no problems with a stiff 25-knot headwind and a few moments later, NASA's oldest surviving space shuttle rolled to a halt, wrapping up a career spanning some 5,750 orbits, 148 million miles and 365 days in space during 39 missions since its maiden launch in August 1984. "And Houston, Discovery, for the final time, wheels stopped," Lindsey radioed flight controllers in Houston. "Discovery, Houston, great job by you and your crew," replied astronaut Charles Hobaugh in mission control. "That was a great landing in tough conditions and it was an awesome docked mission you all had. You were able to take Discovery up to a full 365 days of actual time on orbit. I think you'd call that a fleet leader and a leader of any manned vehicle for time in orbit. So job well done." With only two more missions left on NASA's shuttle manifest -- a flight by Endeavour in April and a final voyage by Atlantis in late June -- Discovery's landing marked the beginning of the end for the world's most complex -- and expensive to operate -- manned rocket. "We're seeing a program come to a close here and to see these shuttles, these beautiful, magnificent flying machines end their service life is obviously a little bit sad for us," Barratt said earlier this week. "But it is about time, they've lived a very long time, they've had a fabulous success record, they've built this magnificent space station, they've given us lots of science and a tremendous amount of experience of just how to operate in space. More than anything, we look forward to seeing them retire with dignity and bringing on the next line of spaceships." Lindsey, Boe, Barratt and their crewmates -- Nicole Stott and spacewalkers Stephen Bowen and Alvin Drew -- were welcomed home by NASA Administrator Charles Bolden, space operations chief Bill Gerstenmaier, shuttle program manager John Shannon, Launch Director Mike Leinbach and scores of other agency managers and engineers who turned out for Discovery's final homecoming. "It's great to be back," Lindsey said on the runway. "Discovery launched and came back on this flight, just like my previous two flights on Discovery, with absolutely no liens against her, no single system with any problems whatsoever. ... It's because of the Kennedy Space Center work force here that takes care of this vehicle, it came back as perfect on its final flight as it did on its first flight. "This is a pretty bittersweet moment for all of us. As the minutes pass, I'm getting sadder and sadder about this being the last flight. And I know all the folks involved in the shuttle program feel the same way." Lindsey thanked Discovery's processing team for "giving us just a fantastic vehicle to fly. It was a privilege to be in charge of her for just a couple of weeks and I'm sad to give her back. But I couldn't imagine giving her back into better hands than this group right here." Over the course of an extended 13-day mission, Lindsey and his crewmates attached a final U.S. module to the International Space Station, delivered a spare set of radiator panels and an external stowage platform and transferred several tons of supplies and equipment to the lab complex. Bowen and Drew also staged two spacewalks to accomplish a variety of long-planned maintenance tasks. And the astronauts helped their station colleagues service a U.S. oxygen generator and a carbon dioxide removal system. "When we walk away from her on the runway after we land, there's going to be tears in my eyes, I know," Stott said of Discovery. "I worked with her at Kennedy Space Center and the chance to fly (the last mission) has just been a real, real privilege." With Discovery safely back on Earth, engineers in the nearby Vehicle Assembly Building made final preparations to haul the shuttle Endeavour to launch pad 39A Thursday for work to ready the ship for its 25th and final launch April 19. If all goes well, NASA will close out the shuttle program by launching the Atlantis June 28 on a final space station resupply mission. Discovery's landing brought that long-awaited -- and to some, long-dreaded -- end game into sharp focus. Barratt captured the thoughts of many space workers when he reflected on the shuttle program's legacy from orbit. "I think about this space shuttle fleet like the clipper ships that were strong and fast and powerful, they did their jobs but they were also graceful and beautiful," he said. "They conjured up imagination, of foreign travel, exotic places, of exploration. And Discovery is just an elite member of this elite fleet. "The clippers faded, and it was because there was an alternative, there was another ship that was coming in -- steam power -- that was stronger, faster perhaps, but not quite as beautiful. "We have the legacy of the clippers in our shuttle fleet and it's a legacy that everybody who's ever touched these vehicles should be extremely proud of," he said. "I think the only problem area there is we don't have that follow on, we're not replacing the shuttle with something and I think that's what makes it a little bit sad for us." At the same time, he said, "it is a time to celebrate." "The legacy this spaceship has made for herself is just nothing more than cause for celebration, she's returned so much science, so much experience and the experience that we as crew members have had has just been marvelous and again, something our country should be very, very proud of." In the wake of the 2003 Columbia disaster, the Bush administration ordered NASA to complete the International Space Station and retire the shuttle by the end of fiscal 2010, a target that eventually slipped to June because of a variety of technical issues. The idea was to free up money to develop a new generation of safer, lower-cost rockets and spacecraft to carry astronauts back to the moon by the early 2020s. But the Bush administration never fully funded the proposed Constellation moon program and President Obama concluded it was not affordable. He ordered NASA to help private industry develop commercial spacecraft to ferry astronauts to and from the space station while the agency focuses on deep space exploration. How that strategy will play out in the ongoing budget debate is not yet clear. But for the next several years, until a new rocket debuts to replace the shuttle, the only way for U.S. astronauts to reach orbit will be to hitch rides aboard Russian Soyuz spacecraft. "This was a pretty bold and audacious thing to put together back in the 1970s and I just don't know if we have that audacity now to build something nearly as ambitious as the shuttle." Over the next few months, Discovery will be decommissioned and ultimately turned into a museum display. NASA has not yet announced where the orbiters will end up, but it's widely expected that one of them will be displayed at the Smithsonian's National Air and Space Museum. The contract authorizing construction of Discovery was awarded Jan. 29, 1979, and initial work to begin building the crew module began the following August. The spacecraft was completed at North American Rockwell's Palmdale, Calif., plant in October 1983 and was ferried to the Kennedy Space Center Nov. 9, 1983. Following an on-pad main engine test firing June 2, 1984, NASA attempted to launch Discovery on its maiden voyage the following June 26. But in a moment of high drama, the shuttle's main engines shut down seconds after ignition because of a sluggish fuel valve. The problem was corrected, and commander Henry Hartsfield and his crew, including Challenger astronaut Judith Resnik, finally blasted off Aug. 30, 1984, on a successful mission to deploy three commercial communications satellites and to test space station construction techniques. Over the next 26 and a half years and 39 flights, Discovery carried out four military missions, two Spacelab science flights, two visits to the Russian Mir space station, one Mir docking and 13 missions to the International Space Station. At least 24 civilian and military satellites were carried into space, including the Hubble Space Telescope. Discovery also flew the return-to-flight missions following the 1986 destruction of the shuttle Challenger and the 2003 loss of Columbia. In addition, two stranded communications satellites were plucked out of orbit by spacewalking astronauts and brought back to Earth for repairs in November 1984 in what many veterans consider the most daring shuttle mission ever attempted. "When you really look at the space shuttle and its capability, it can do everything, everything you can think of in space except for one thing, it can't leave low-Earth orbit, but it can do everything else," Lindsey said in a NASA interview. "It can do robotics. It can do science. It can go dock. When you dock with the space station, in the end you have to maintain a three-inch corridor and one degree of attitude error and you can easily fly the shuttle manually and maintain that. I mean, that's unbelievable for a 120-ton vehicle. "I don't think there's going to be another one that's ever going to match the versatility of the space shuttle, and I think that's the legacy."